Tuesday, May 13, 2003... Hello again from Fresno. I made only one stop today, but it was a good one: Yosemite National Park. 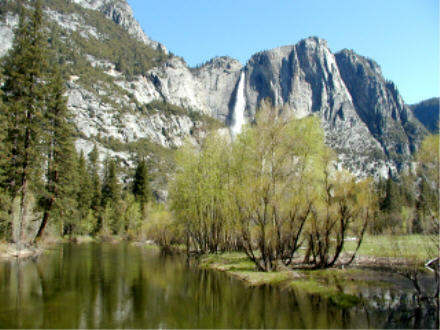 The drive from Fresno to the park couldn't be easier, as the main north-south route through town dead-ends at Yosemite. The first point of interest is Yosemite's Mariposa Grove of giant sequoias. These aren't quite as large as the ones I saw yesterday, but after a tree grows 200' high with a circumference of over 80' -- the vegetable world's version of Met first baseman Mo Vaughn, with equivalent mobility -- the extra growth is only noticeable in context. Alas, I had come a few weeks too early for two of the park's main attractions: the Tioga Road across the Sierras, and the Glacier Point drive to the most spectacular overlook in America. From Glacier Point, 3,200' above the floor of Yosemite Valley, a visitor can look down on the highest waterfall in North America, and follow the progress of hikers trying to climb the perpendicular rock face of Half Dome. These roads close for the season with the first snowfall and don't reopen until the roads have been cleared. Although today dawned sunny and warm, Yosemite was still recovering from several feet of April snow. As a result, my sightseeing was limited to Yosemite Valley. This was hardly a problem, though. Even when all the roads are open, the typical Yosemite tourist never leaves the seven square miles of the Valley. After years of traffic jams and parking nightmares, the National Park Service has closed several Valley roads to passenger cars, forcing visitors onto a network of free shuttle buses. Many sights on the west side of the Valley remain drivable, with the two main roads one way in each direction. I had come at the height of waterfall season. Yosemite Valley's waterfalls are small streams, generally fed by snowmelt, which flow quietly along the heights until suddenly falling off cliffs into the Valley. The highest, Yosemite Falls, drops 2,425' in three stages; the top stage, 1,430' Upper Yosemite Falls, is visible in the picture below. By late summer Yosemite Falls dwindles to a trickle, sometimes even running dry. This time of year, though, it thunders. So does Bridalveil Fall, the spray from which soaked anyone who came within 50 feet of the end of the viewing trail. Other falls, notably 1,612' Ribbon Fall, flow only in the spring runoff season. I hiked to the base of Yosemite and Bridalveil Falls, both short, easy hikes. 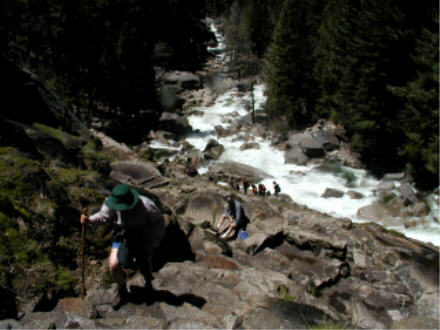 Then I got ambitious: the three-mile (round trip) hike to the top of Vernal Falls, with a 1,000' elevation gain en route. The walking didn't bother me at all...but the stairs did. The final stage of the ascent involves climbing a ladder of rock stairs. Uneven rock stairs worn smooth by generations of feet. Uneven rock stairs worn smooth by generations of feet, then made even slicker by melting snow and standing water. The question was when, not whether, I would slip and fall. Walking in a defensive, head-down-and-arms-out position, I made it 2/3 of the way up the stairs before my foot slipped and my right hand and left knee introduced themselves to the next step. When I reached the next viewing platform I declared victory and beat a careful retreat, glad to have avoided damage to self or camera. I've been to Yosemite several times before. I'll be here again -- ideally during the weeks immediately after the opening of the Glacier Point and Tioga Pass roads. For tomorrow, though, I'm back on 99, northbound to Sacramento and later westbound to another Baseball Prospectus Pizza Feed in the East Bay. Later!